RAPAPORT... The National Bank of Fujairah (NBF) has launched a representative office in Antwerp as it looks to expand its business lending to established diamond traders. The Dubai-based bank targets wholesalers with secure sources of income and solid product traceability, its CEO, Vince Cook, told Rapaport News last week. 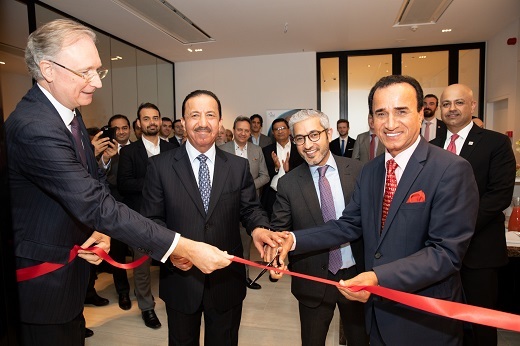 The new office will help it improve its market knowledge and strengthen its relationships with those clients, while benefiting from Belgium’s strong compliance regime, he said. NBF has lent to the gold and jewelry industry for many years, and later decided to enter the diamond space. Aware that the sector operated in a different way from the industries it knew, it launched its diamond-focused office in Dubai in 2015 by hiring a team from the defunct Antwerp Diamond Bank (ADB). Its diamond business has grown, but it became clear that it needed a base in Belgium to develop the division, as many of its clients had operations in both Antwerp and Dubai, Cook noted. It will still provide its loans out of the Dubai office, as it’s not a licensed bank in Belgium. NBF’s practice of creaming off the clients with the most suitable business models enables it to expand in a sector from which other banks are retreating, Cook explained. ADB, ABN Amro, Standard Chartered and India’s ICICI Bank have all left the business or scaled back their lending in recent years. While NBF does finance established companies’ rough purchases for manufacturing, most of the trade credit it provides is for buyers and resellers of rough, it noted. The drop in bank credit has mainly been in the polishing sector, where market fluctuations have put pressure on banking relationships, Cook added. Firms focused on mass manufacturing of small diamonds have lost out significantly, as have small traders that operate without knowing for sure that they can sell their goods, he said. “If you’re taking diamonds from an established mine and producing them to order for one of the big jewelry brands, things haven’t changed much,” Cook said. Many banks that serve a wide range of market players, from huge cutting businesses to small traders, have had bad experiences, the executive observed. Those lenders inevitably come away with a negative perspective of the market, as that broad spectrum of clients will always include some failures, he said. Requiring reliable diamond sourcing is a key part of that focus on secure business activities. NBF will only lend to companies that obtain stones from a list of acceptable sources that meet compliance requirements, Cook said. It will also want to know for what purpose its clients’ buyers will be using the goods, ensuring there is real demand at the consumer end, he added. The recent alleged $2 billion fraud by Nirav Modi and Mehul Choksi against Punjab National Bank has created increased awareness of the dangers of sham diamond sales carried out purely to extract loans. Meanwhile, traceability initiatives such as the Gemological Institute of America’s Mine to Market (M2M) program provide information on a company’s diamond supply that wasn’t available a few years ago. While there are many other sources of information on a business’s legitimacy, provenance initiatives will increasingly play a part in banks’ lending decisions, he said. With NBF now on the ground in Dubai and Antwerp, it sees no need to add any further offices for the time being, as those two hubs cover the bulk of its client base. Indeed, the bank’s decision reinforces the attraction of the city’s diamond industry to lenders, argued Ari Epstein, CEO of the Antwerp World Diamond Centre. “Anyone that does his homework and is prepared to acquire thorough knowledge about the diamond industry will recognize that the many strict measures applicable to the diamond industry enable a financial service provider to develop a robust business,” Epstein said.